We import these professional paper trimmers from Dahle, a German manufacturer of precision steel cutting tools. Designed for rugged professional use, they are an indispensible tool in many design studios and advertising agencies. Make precise, burr-free cuts and trims on paper, photos, film, foil, and cardboard. Both the upper and lower hardened steel blades are ground, and self-sharpening. 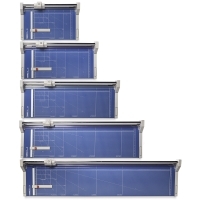 Sheet capacity is 20 sheets (14 sheets for the 37½" large format model). Dahle's steel cutting wheel is safely enclosed in a plastic housing. This cutting assembly rides on a polished steel guide rail and engages an automatic gripping clamp to ensure clean, uniform cuts. 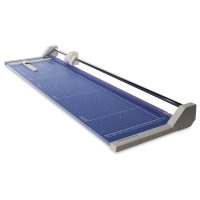 Trimmers are mounted on a heavy-gauge steel base with solid rubber mounts. 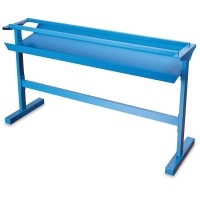 The entire unit can be mounted to a table or wall. Trimmers are pre-printed with a reference grid and a scale bar calibrated in both inches and centimeters. ® Dahle is a registered trademark. We import these professional paper trimmers from Dahle, a German manufacturer of precision steel cutting tools. Designed for rugged professional use, they are an indispensible tool in many design studios and advertising agencies. Make precise, burr-free cuts and trims on paper, photos, film, foil, and cardboard. Both the upper and lower hardened steel blades are ground, and self-sharpening.